cullmann reopened D20697: Review IconBorder. loh.tar, can you take a look? If it is too complex to fix easily, we can still revert this and apply it again later together with a fix. Thanks for pointing the CI fail out David! cullmann added a comment to D20697: Review IconBorder. :( Sorry, I didn't run them again, just tried out if it works in KDevelop. cullmann accepted D20697: Review IconBorder. This works for me fine with KDevelop. I am not sure one can delay the updateGeometry stuff until one paints. cullmann requested changes to D20697: Review IconBorder. Unfortunately, the annotation stuff regressed. See pre-patch and post-patch pictures below, the too small one is the post patch one. cullmann added a comment to D20766: Use appropriate background color for text previews. 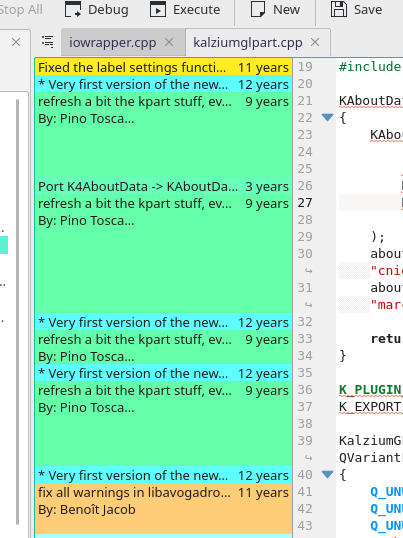 I actually think the theme should contain all colors hard-coded and KTextEditor should properly use that instead of currently the mix of hardcoded/defaults. The only automatism should be (in my eyes) to switch between a light/dark variant automatic depending on the base color of the current window. But that is only my opinion. I think the "we adapt to the color scheme" stuff is flawed. cullmann accepted D20765: Add input methods to input method status bar button. cullmann committed R40:64e1cc6bdd17: try to avoid crash during tab adding/removal (authored by cullmann). cullmann closed D20722: ViewSpace: Don't ASSERT, just check for valid doc to remove from tab. cullmann accepted D20722: ViewSpace: Don't ASSERT, just check for valid doc to remove from tab. Then we try that patch in master. I think re-shuffling the indices there is no good idea. cullmann accepted D20742: Paint the folding marker in propper color and make it more visible . Both diff + output change in the screenshot look reasonable for me. cullmann committed R40:0aa7c4d383d3: Kate: Keyboard shortcuts F6/Shift+F6 for Next/Previous Match (authored by cullmann). cullmann closed D17443: Kate: Keyboard shortcuts F6/Shift+F6 for Next/Previous Match. cullmann committed R39:8193e735bca2: remove default shortcut F6 to show icon border (authored by cullmann). cullmann closed D17442: KTextEditor: Tweak keyboard shortcuts to free F keys. cullmann accepted D17443: Kate: Keyboard shortcuts F6/Shift+F6 for Next/Previous Match. We go with the minimal needed changes. cullmann accepted D17442: KTextEditor: Tweak keyboard shortcuts to free F keys. We go with the minimal invasive effort ATM: just remove F6. We can introduce the CTRL-E... stuff later. cullmann added a comment to D20722: ViewSpace: Don't ASSERT, just check for valid doc to remove from tab. cullmann added a reviewer for D20722: ViewSpace: Don't ASSERT, just check for valid doc to remove from tab: dhaumann. Hmm, the internal state is really broken if that doesn't work. I don't think this check will really solve the issue. Had you any chance to see a backtrace with e.g. the index? cullmann accepted D20565: Ensure not to fold the end marker. cullmann accepted D20606: Add action to toggle folding of child ranges. Given we have no actions and some more proper documentation, I am in favor of this. cullmann committed R40:fac21b07edf6: avoid tooltip just duplicating name of tab (authored by cullmann). cullmann requested changes to D20606: Add action to toggle folding of child ranges. The question is: with a context menu, isn't that then already too inconvenient? At the moment we have no context menu for the bar at all. I could live with the right click for the moment, we can still enhance that, if we add further "actions". But I think we need at least an action in the "Code Foldings" sub-menu that does trigger this for the current active folding region. If that is there, more can follow in extra changes, I think. cullmann closed D18996: Fix building with namespaced Qt. The build issue got fixed. cullmann added reviewers for D20606: Add action to toggle folding of child ranges: ngraham, dhaumann. I think the feature is nice. cullmann added reviewers for D20565: Ensure not to fold the end marker: dhaumann, ngraham. cullmann accepted D20542: Retitle button "Close" to "Close file" when a file has been removed on disk. cullmann committed R39:893faf36662a: fix folding offset (authored by cullmann). cullmann added a reviewer for D20542: Retitle button "Close" to "Close file" when a file has been removed on disk: ngraham. Perhaps Nate has feedback, too. I have no issues with this change. cullmann committed R40:5f0b76f2a80c: we live in a https world now (authored by cullmann). cullmann added a comment to D20534: avoid conflicting shortcuts for switching tabs. cullmann committed R39:59afcab3fb1b: up copy-right, perhaps that should be a define, too (authored by cullmann). cullmann committed R39:9f2ffd36c587: avoid conflicting shortcuts for switching tabs (authored by cullmann). cullmann closed D20534: avoid conflicting shortcuts for switching tabs. cullmann added a comment to D17857: DocumentPrivate: Don't jump view when edit using 'scroll past last line'. :=) Nice that it helps. cullmann added a comment to R39:4396efe1cdce: KateIconBorder: Fix folding popup width and height. Guess I need to check that in the future more properly. cullmann added reviewers for D20534: avoid conflicting shortcuts for switching tabs: Kate, ngraham, dhaumann. cullmann requested review of D20534: avoid conflicting shortcuts for switching tabs. cullmann committed R39:4396efe1cdce: KateIconBorder: Fix folding popup width and height (authored by cullmann). cullmann closed D20495: KateIconBorder: Fix folding popup width and height. cullmann accepted D20495: KateIconBorder: Fix folding popup width and height. cullmann committed R39:a9f97f1be115: avoid view jump to bottom on folding changes (authored by cullmann). Ok, I can reproduce the issue you mention. cullmann added a comment to D7497: Fix Ctrl PageUp/PageDown shortcut conflict due to KF 5.37..
Nate, would you be ok with this, too? Could live with moving that to ALT and the select to SHIFT-ALT. 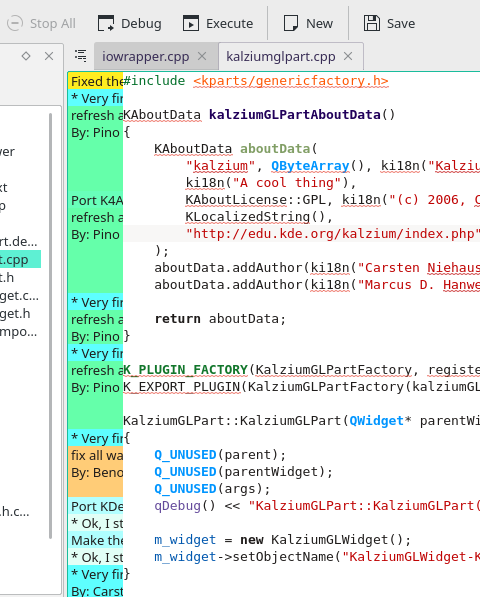 But as "we are all here" anyways: Any ideas for better shortcuts in KTextEditor? cullmann accepted D19450: DocumentPrivate: Respect indention mode when block selection. cullmann added a comment to D19450: DocumentPrivate: Respect indention mode when block selection. Just had not looked at this. Looks reasonable, please push that. cullmann abandoned D17432: WIP: Add Analyzer Tool "Cppcheck (for C)". cullmann commandeered D17432: WIP: Add Analyzer Tool "Cppcheck (for C)". Please submit a new request to make the existing analysis more clever for different languages. Restricted Application added a project to D7497: Fix Ctrl PageUp/PageDown shortcut conflict due to KF 5.37.: Kate. What shall we do with this? cullmann abandoned D12295: Supporting nested brackets for Kate autobrackets. cullmann commandeered D12295: Supporting nested brackets for Kate autobrackets. We close this in favor of the other patches. cullmann accepted D17857: DocumentPrivate: Don't jump view when edit using 'scroll past last line'. 5.57 released, should ne tried now. cullmann added a comment to D20499: Support gzipping of svgz also on windows, using 7z. I glanced at it, thought I have at home no Windows machine at hand to test if the command line works as planned. cullmann added a comment to D19511: ViewPrivate: Disable read-only mode action when doc is modified. I still think we should stay with status quo, can you drop this request? cullmann added a comment to D15930: Add more icons to actions. Hi, if you have no update for this, could you close the request? Thanks. cullmann requested changes to D17308: Make CTags/Projects context menu more accessible. I reconsider, I see no real value in removing the layout beside having a more densely populated toplevel menu. cullmann abandoned D18090: PyFalkon build with pyside 5.12 version. cullmann commandeered D18090: PyFalkon build with pyside 5.12 version. Please submit a new fix, if you have time. cullmann added a comment to D20166: Keep desktoptheme SVG files uncompressed in repo, install svgz. The CI is a bit unhappy with the gzip depedency on Windows. Might one just write a minimal KArchive based gzip'er for this? gzip isn't there on any normal Windows machine, even if you have libz. cullmann accepted D19608: DocumentPrivate: Make bracket handling smart. Works for me, beside that the patch no longer cleanly applies. But with some false removed and the later parts skipped, it did work as advertised. cullmann accepted D20264: Add test for "Auto Reload Document" option. I think this can go in as is, as long as the test works determinstically, which I assume it does. cullmann accepted D19691: ViewInternal: Review drop event. Played a bit here with the new behavior, MUCH better than the old one. cullmann committed R40:45b99aa2c3ac: With Qt >= 5.10.0 use QSortFilterProxyModel instead of… (authored by ahmadsamir). cullmann closed D20394: With Qt >= 5.10.0 use QSortFilterProxyModel instead of KRecursiveFilterProxyModel. cullmann committed R216:0e2d7e61a256: Add syntax highlighting for fish shell (authored by cullmann). cullmann closed D20233: Add syntax highlighting for fish shell. cullmann committed R216:1726c4f868f6: AppArmor: don't highlight variable assignments and alias rules within profiles (authored by nibags). cullmann closed D20221: AppArmor: don't highlight variable assignments and alias rules within profiles. cullmann committed R39:2a0cf7044f75: Allow to close a document whose file was deleted on disk (authored by meven). cullmann closed D20467: Allow to close a document whose file was deleted on disk. cullmann accepted D20467: Allow to close a document whose file was deleted on disk. I think this should go in. cullmann added a comment to D20467: Allow to close a document whose file was deleted on disk. The current implementation at least closes the file, in all applications. It just doesn't remove in in all of them from the document list. I think that is ok enough, more can't be done in KTextEditor. Extra reviews for extending the applications are welcome. I think the solution with the bool setting is good enough. If nobody else disagrees, I would accept this later. One could try to first do a closeUrl and just do the closeDocumentInApplication() in addition afterwards. If you really want to close the document aka removing it from the application's document list, you need the interface. That is because KWrite doesn't implement that interface function, unfortunately. cullmann added reviewers for D20467: Allow to close a document whose file was deleted on disk: Kate, Frameworks. cullmann accepted D20434: KateIconBorder: Use UTF-8 char instead of special pixmap as dyn wrap indicator. cullmann requested changes to D20434: KateIconBorder: Use UTF-8 char instead of special pixmap as dyn wrap indicator. I think to not agonize MSVC it would be better to use the unicode code point for the QChar constructor. After that is altered I think, too, this should go in, nice! cullmann accepted D20233: Add syntax highlighting for fish shell. Ok, then we keep that license and push this as is. cullmann committed R40:aefe636289d6: Project plugin: sort the tree view case insensitively (authored by ahmadsamir). cullmann closed D20319: Project plugin: sort the tree view case insensitively. cullmann accepted D20372: [kemoticons] make it compile without foreach. cullmann committed R40:36b9beaa605f: improve comment (authored by cullmann). cullmann committed R40:2b6ead1d6db3: fix handling of sub modules in git rely on ls-files --recurse-submodules, there… (authored by cullmann). cullmann added a comment to D20343: fix handling of sub modules in git rely on ls-files --recurse-submodules, there since end of 2016. Yes, I cherry-picked the change to 19.04, will mark bug as done. cullmann committed R954:33004e46d433: cartoonized version (authored by cullmann). cullmann committed R40:8911d3aa2081: improve comment (authored by cullmann). cullmann committed R40:a8ec6828ee84: fix handling of sub modules in git rely on ls-files --recurse-submodules, there… (authored by cullmann). cullmann closed D20343: fix handling of sub modules in git rely on ls-files --recurse-submodules, there since end of 2016.
cullmann accepted D20221: AppArmor: don't highlight variable assignments and alias rules within profiles. See no obvious issues, please commit, thanks! cullmann added a comment to D20233: Add syntax highlighting for fish shell. If you think you nearly changed everything, I guess MIT is ok.
cullmann accepted D20319: Project plugin: sort the tree view case insensitively. cullmann accepted D19446: DocumentPrivate: Support auto bracket in block selection mode. The new functionality works ok enough for me. cullmann added a reviewer for D20343: fix handling of sub modules in git rely on ls-files --recurse-submodules, there since end of 2016: loh.tar.